Spooky New England, retold by S.E. Schlosser, 2003. "Tales of hauntings, strange happenings and other local lore." 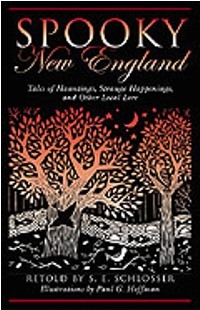 A collection of 30 creepy tales set in various locations around New England. Great for reading around the campfire or in a darkened room. Compiled by a master storyteller, with evocative illustrations by Paul Hoffman. 200 pp., 5 1/2" x 8 3/8."